“The security of my living here gives my children the ability to travel and lead their own lives!” - L.E. Leading an active life in retirement means living without everyday worries about health care or concerns about being able to afford it. That’s why LifeCare at Lambeth House in New Orleans is so unique: you have all the freedom, flexibility and independence you want today, plus the incredible peace of mind that comes with knowing your plans for the future are secure. As a continuing care retirement community, Lambeth House offers independent living, assisted living, nursing care, and memory care, all on site. This means you will not have to move from Lambeth House if you or your spouse experiences a change in health. You have assured access to high quality care from professionals you know and trust—when needed, for as long as needed. LifeCare is a guarantee of outstanding care for life, at predictable monthly rates. Available to independent living residents only… LifeCare ensures priority access to long-term assisted living and nursing care—if needed—at little or no increase in monthly fees. You pay a one-time entrance fee, which is 90% refundable to you or your estate, regardless of how long you reside here. The entrance fee makes LifeCare possible, and a portion of your entrance fee and monthly fees are tax deductible as prepaid medical expenses. This unique combination of benefits offers you powerful asset preservation and control over your finances, which gives you more predictability and peace of mind. At Lambeth House, you can look to the future with confidence—with respect to your health and your finances. Lambeth House accepts direct admissions to assisted living, nursing care and memory care on a monthly fee basis, based on availability. 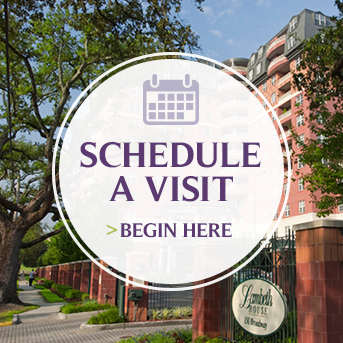 Please click here to plan your visit online or call (504) 865-1960. Please also feel free to bring your accountant or financial advisor with you.